Galaxy Note 9 to feature extra button for screenshots, video recording? Galaxy Note 9 to have capture button for screenshots, video recording? Samsung is reportedly adding an extra button to the upcoming Galaxy Note 9. The new button could potentially be used for screen capture and video recording. You won’t have to wait too long to find out more because the phone is tipped to launch in August. The Galaxy S8 introduced the Bixby button, allowing users to quickly access Samsung’s virtual assistant. It looks like the company isn’t stopping there, as the upcoming Galaxy Note 9 might get a “capture” button. According to the Korean-language Herald news outlet [Google Translate], the Galaxy Note 9’s new button will appear on the lower side of the phone. Claims of an extra button first emerged several days ago, when Android Headlines reported on a supposedly leaked protective case, featuring five cutouts for buttons instead of four. It’s unclear how the new button will be used (the translated report isn’t great), but the Korean publication notes that Samsung recently filed a trademark for “perfect capture technology.” The outlet seems to suggest the button could either be a camera shutter key or an easier way to perform a screenshot. To take a screenshot on a Samsung phone right now, users either have to press power and volume-down, or drag the side of their hand across the screen. The latter isn’t quite as intuitive as Huawei’s double knuckle-tap gesture, it must be said. What else can you do with the button? 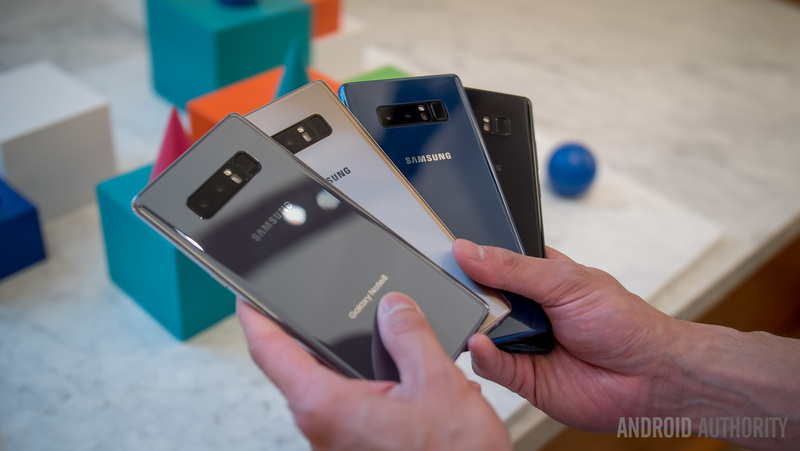 Four Galaxy Note 8 devices. A button dedicated to screenshots seems a little odd, doesn’t it? Nevertheless, it’s believed Samsung is tuning its Bixby assistant to search for information captured in the screenshots (e.g. products, locations, movies). If that all sounds very familiar, that’s because Google did it first with Google Now On Tap. The Korean outlet also moots the possibility of video recording via the button. It’s unclear whether this is traditional video recording or screen recording. In any event, a video shutter key might be handy for quickly activating super slow-motion recording, as an example. A screen recording button could also be useful for mobile gamers, allowing them to seamlessly capture gameplay with a quick button press just like on current gaming consoles like the PS4 and Nintendo Switch. You’d think the new key would be a no-brainer for a photo shutter button, but an industry official told the Herald that this was “unlikely.” After all, most phones on the market right now let you take snaps with the volume key. The Samsung Galaxy Note 9 is set for a reveal on August 9, according to the Korean publication and Bloomberg. So you should expect button-related information (and other details) to be revealed over there.